Creating a custom landscape design is a dynamic, collaborative process that requires careful attention to all the design details. The design process involves assessing the existing site conditions, gathering ideas, creating conceptual designs, researching possibilities, and planning the final details - with you being involved every step along the way. While walking around your property, we can discuss what’s working and not working for you in your existing landscape, as well as the scope of your intended future landscape project. This personal interview process will also help determine your aesthetic preferences, interests, lifestyle, functional needs, budget range, and future level of maintenance, as well as provide an opportunity for you to share your own creative ideas. 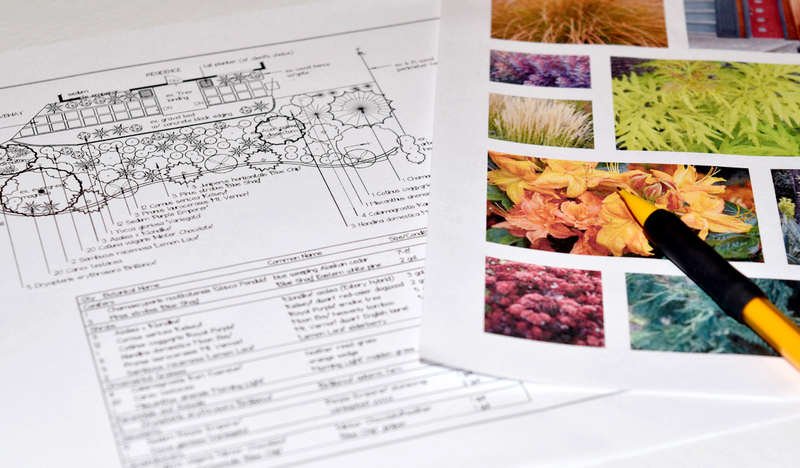 A detailed proposal will then be emailed to you that summarizes the agreed-upon scope of work, specific design elements to be included, and the Landscape Design service fee. Upon the receipt of your signed proposal and 50% deposit, we can begin the next phase of your design process. Site measurements are completed of your home’s “footprint”, property lines, existing hardscape elements (such as driveway, paths, deck, patio, walls, & fences) and any existing plants that will remain. Photos are also taken from various viewpoints for future reference. From the site measurements, a detailed base map is created using a CAD-based software program. A thorough site analysis also includes noting any existing conditions that need to be considered, such as grade, soil condition, drainage, sun/wind exposure, viewpoints, and immediate surroundings. Any pertinent information relating to site setbacks and restrictions is also researched as needed. Based on our preliminary discussion and the site analysis, one or more preliminary design concepts are created, presented and reviewed with you. These colored conceptual designs enable you to visualize possible spatial layouts for your future landscape. 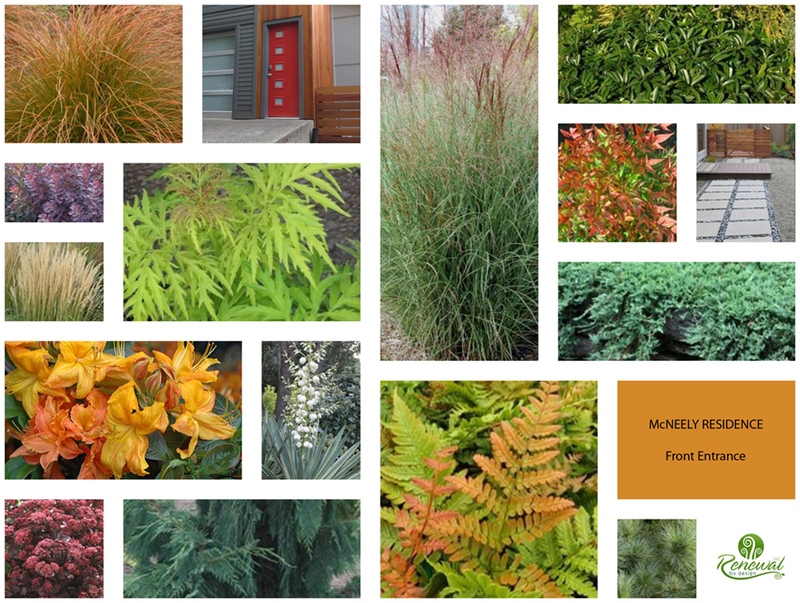 During this meeting, we also review a proposed selection of plants appropriate for your site conditions, as well as any hardscape material options. A final master landscape plan is completed, presented and reviewed with you. 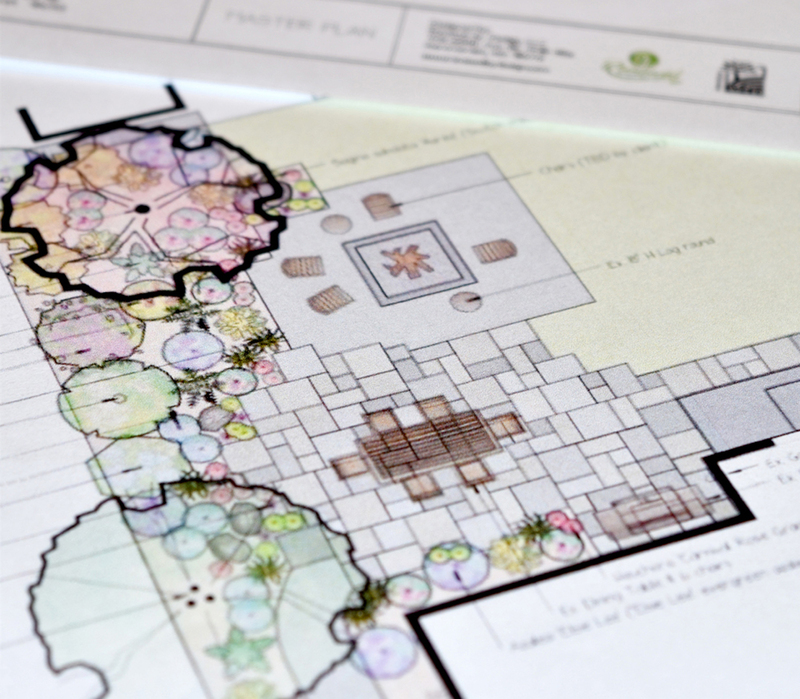 The master plan includes a site development plan with all the hardscape elements & material choices, plant beds, lighting layout, and installation notes, as well as a planting plan with plant locations, names, sizes, and quantities. Any existing plants to be removed or relocated are noted, and photos of the final selection of plants are provided. Throughout the installation process of your landscape design, on-going collaboration with you and your chosen professional Landscape Contractor will help ensure that your landscape project is completed as envisioned. This collaborative process involves close communication & coordination, and on-site meetings.